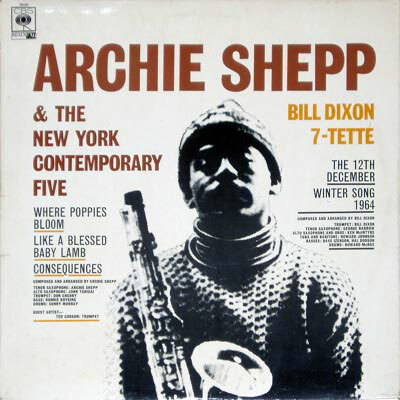 This early Shepp recording catches him with the enormously influential and shockingly new 'New York Contemporary Five'. The group only stayed together for about a year, it's complete lack of commercial potential mitigating against it's survival. Sadly only one of the tracks presented here is a true NYCF performance - Don Cherry was late for the session so only plays on 'Consequences' - the other tracks feature Ted Curson in a 'guest artist' role showing himself to be more than a match for a fiery, youthful Shepp. Something that really stands out when listening to this music is the harmonic approach - for 1964, this is pretty far out in terms of dissonance. The opening theme of 'Where Poppies Bloom' must have terrified critics and public alike with it's complete disregard for tonality. Yet, in other respects the music is relatively conventional - the standard theme-solos-theme structure of all bop based musics is adhered to, the rhythm section play in time, walking bass lines are heard prominently. There's even a pervasive blues influence on 'Like A Blessed Baby Lamb' (but then the blues are never far away in any of Shepp's music). 'Consequences' takes things a little further out, possibly due to Cherry's influence, and features Shepp's best performance on the record. He's at his best when matching his abrasive tone with searing runs that start off one way then change, mid sequence, into a totally different harmonic area. The Bill Dixon side is interesting - in a band featuring, among others, Howard Johnson on tuba and David Izenon on bass, Dixon's compositions are presented in a much more accessible way to those of his counterpart on side one.